As our love affair with the game continues to grow, we have advice on how to take a proactive approach that will prepare your body for many years of pain-free play. Back pain is a warning sign that there is an underlying problem responsible for a symptom that will likely get worse. Many sportsmen go on until they get hurt, then look for help. Doctors of chiropractic look for the cause of the symptom and help reduce the likelihood of future injury. For the women in golf: If you have “inherited” your husband’s or significant other’s golf clubs, they might be difficult for you to use. Not only are the clubs often too long, but also the shaft is often not flexible enough for a woman’s grip. Women typically play better with clubs that are composed of lighter, more flexible material, such as graphite. For all golfers: For some, the score may not be as important as enjoying the social benefits of the game. Having clubs that are comfortable will increase the chances of playing for a long time without significant physical limitations. Warm up before each round. Stretching before and after 18 holes is the best way to reduce post-game stiffness and soreness. Take a brisk walk to get blood flowing to the muscles; then do a set of stretches. To set up a stretching and/or exercise routine, see a doctor of chiropractic or golf pro who can evaluate your areas of tension and flexibility. Take the “drop.” One bad swing/ striking a root or a rock with your club-can damage a wrist. If unsure whether you can get a clean swing, take the drop. Doctors of chiropractic are trained and licensed to treat the entire neuromusculoskeletal system. 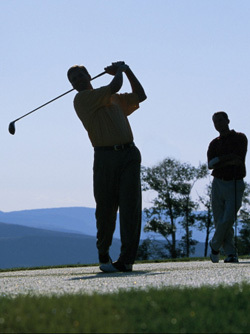 Some doctors of chiropractic have specialised training in sports medicine and can provide advice for golfers to help them decrease the stresses and strains placed on their bodies. Doctors of chiropractic can address other health concerns, such as shoulder, knee, arm and wrist pain that could affect your game. If you play golf consistently, you will no doubt feel the stress of the game, but by following a few simple prevention tips, it is possible to play without pain for a lifetime. Call 020 8905 4440 today!